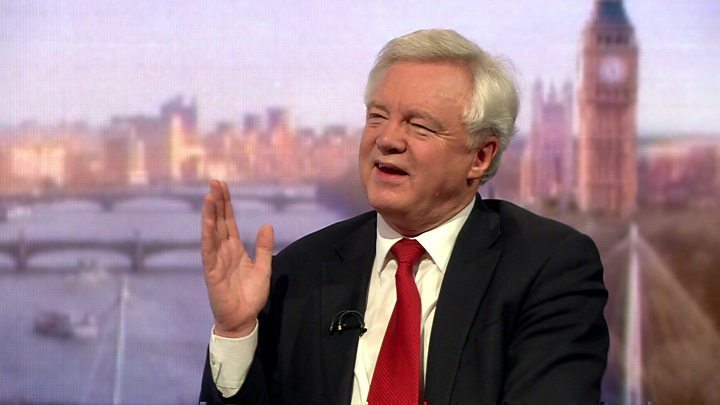 Media captionDavid Davis: "No deal means we won't be paying the money"
Brexit Secretary David Davis says the UK wants to secure a free-trade deal with no tariffs when it leaves the EU. He described it as "Canada plus plus plus" - a reference to the free trade deal struck between Canada and the EU. But unlike the Canada deal, he wants financial services included in the tariff-free area, he told Andrew Marr. Labour says the UK should "stay aligned" to the EU after Brexit and could pay to access the single market like Norway. The Conservatives claim this would "mean billions of pounds going to the EU in perpetuity" and the UK "being forced to obey rules over which we have no say". Canada's deal with the EU, signed last year, removes the vast majority of customs duties on EU exports to Canada and Canadian exports to the EU but without paying for access to the single market. But Mr Davis said he wanted a "bespoke" deal with the EU and was aiming for "overarching" agreement with no tariffs, that included the service industries - which are a key part of the British economy. Referring to some of the EU's trade deals, he said: "We'll probably start with the best of Canada, and the best of Japan and the best of South Korea and then add to that the bits that are missing which is the services." He said the odds of the UK exiting without a deal had "dropped dramatically" following Friday's joint EU-UK statement in Brussels. But he stressed that the deal struck by Theresa May on Friday to move to the next phase of talks was a "statement of intent" and not "legally enforceable". And if the UK failed to get a trade deal with the EU then it would not pay its divorce bill, which the Treasury says will be between £35bn and £39bn. But the Irish government said that as far as it was concerned the agreement signed on Friday between the EU and the UK was binding. "The European Union will be holding the United Kingdom to account," the Irish government's chief whip told RTE. "My question to anybody within the British government would be, why would there be an agreement, a set of principled agreements, in order to get to phase two, if they weren't going to be held up? That just sounds bizarre to me," Joe McHugh told RTE Radio's This Week. Mr Davis stressed in his Marr interview that the UK was committed to keeping a "frictionless and invisible" Irish border and it would "find a way" to do this if there was a "no deal" Brexit. Mrs May signed an agreement on Friday ruling out the return of a "hard border" on the island of Ireland, protecting the rights of EU and UK citizens and agreeing a formula for the divorce bill. EU leaders are now expected to recommend starting the next phase of Brexit talks at a summit on Thursday. Mr Davis stressed Friday's agreement was conditional on getting a trade deal, agreements on security and foreign affairs, as well as the two-year transition period the UK wants after if officially leaves the EU in March 2019. Friday's agreement includes a fallback position if the UK fails to get a trade deal, which proposes full regulatory "alignment" between the EU and the UK. This clause had been diluted at the insistence of the Democratic Unionist Party, which fears Northern Ireland would be separated from the rest of the UK, and move closer to Ireland, if it had to adopt EU rules to keep goods flowing across the border. But there is still controversy, and confusion, over what "full alignment" would mean in practice, with some Brexiteers fearing the UK would have to continue to abide by EU regulations on agriculture and other issues after Brexit and would not be able to strike its own trade deals. Mr Davis has said "full alignment" would apply to the whole of the UK, not just Northern Ireland, but the Sunday Telegraph said Conservative Brexiteers had been reassured that it was "non-binding" and had been included to secure Ireland's backing for the deal. Pushed to explain what it meant, Mr Davis told Andrew Marr: "We want to protect the peace process and we also want to protect Ireland from the impact of Brexit for them. This was a statement of intent more than anything else." The Labour party has ruled out remaining in the EU single market and customs union if it wins power. But the party's shadow Brexit secretary Sir Keir Starmer said he wanted a partnership with the EU that "retains the benefits of the single market and the customs union". The EU has asked for more clarity from the UK on what it wants from trade talks. But today it was the opposition who gave more details than ever before. So far Labour has said, if in power, it would stay in the single market and customs union in a transition period. But now the shadow Brexit secretary has talked about the benefits of staying in alignment with the EU in the longer term. And he has even suggested he'd be willing to pay for the type of single market access that Norway enjoys. Shadow foreign secretary Emily Thornberry has raised the possibility of staying in a form of customs union. That might restrict the ability to do global trade deals but - as she puts it - she doesn't want to "kybosh" trade with the EU. For the Conservatives in the short term it's a political gift - they can portray Labour as rule takers who are prepared to pay far more to Brussels than their divorce settlement. But it's more likely a sign that "creative ambiguity" across the political spectrum could be unsustainable when serious trade talks begin.